How about a big round of applause for T.L. Collins! Week in and week out, his work has both excited and inspired me. His art got better and better as we went along and he never missed a deadline. Not once. You gotta give it up to him for that. 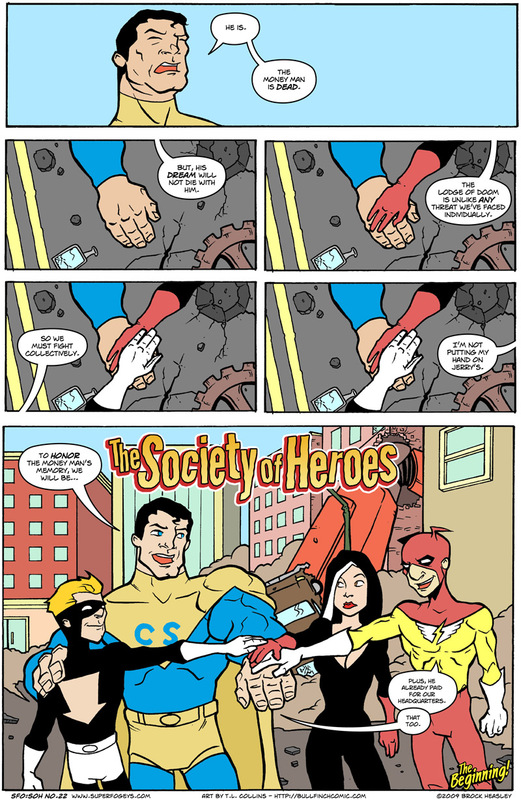 If you haven’t had a chance to read the Society of Heroes origin from the beginning, now’s a great time to take it all in at once. You can start here with the two-page Money Man story or just skip right into the first page of the Society of Heroes origin. Your pick! STARTING ON JULY 28TH…THE ORIGIN OF TANGERINE! For some reason, I get a lot of questions about Tangerine’s origin. Well, I aim to please. Starting July 28th, SuperFogeys Origins continues with the 5-part Tangerine origin, drawn by a very special guest artist…Eldon Cowgur of Astray3! Eldon’s art is just astonishing to me. I wish I had his mastery of the inked line. My stuff can be very cold and calculated at times, but there’s an energy and a balance to Eldon’s work that is terribly exciting. If you haven’t checked out his 5-times-a-week (seriously, how does he do it?) 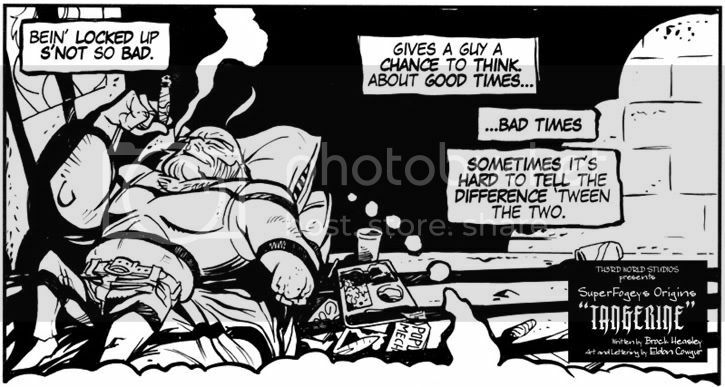 adventure strip, Astray3, do yourself a favor and click on the link now! And now, a preview of Tangerine’s origin. This is the first panel from the first page. As you can see, Eldon’s already got a great handle on the character! C’mon back July 28th for more! T.L. will be back next week with the cover to the first SuperFogeys Origins book, which will be published soon. He’ll be doing the pencils and if my everything goes well with my schedule, I’ll be doing the inks. We’ve never worked together on a piece before, so this’ll be something to see. And then, later, after Eldon’s stint on Tangerine, T.L. will be back with the origin of Herman the Shape-Shifter! That one’s gonna be worth waiting for. See you on Thursday with a very special SuperFogeys 216!